In 2012, director Rian Johnson released his third feature film, a sci-fi drama about a hitman assigned to execute people from the future, and the world-altering consequences of what happens when the person he has to kill is his own older self. Starring Joseph Gordon-Levitt, Bruce Willis, and Emily Blunt, Looper went on to become one of the most acclaimed films of its year and one of the most successful science fiction films of the 21st century so far. It achieved this because of Johnson's smart script and stylish direction, clever production design, great casting and performances, and of course a plot full of intriguing questions, twists, and implications. 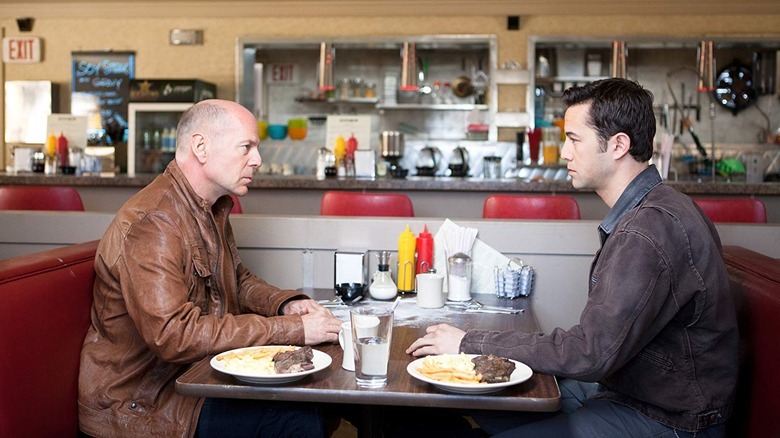 Looper is not a film that tangles you up with multiple plot threads, but it is a film with an extremely provocative final act which leaves viewers both satisfied and contemplative. With that in mind, it's time to revisit that final act, what it means, and what questions it raises for the film's fictional universe. This is the ending of Looper, finally explained. In the world of Looper, time travel is invented in the 2070s… and is almost immediately declared illegal because of the many dangerous implications that come with just handing such technology over to the populace. Naturally, like so many illegal things, time travel technology then falls under the purview of organized crime, who use it to circumvent the tracking technology of the future to get away with murder. 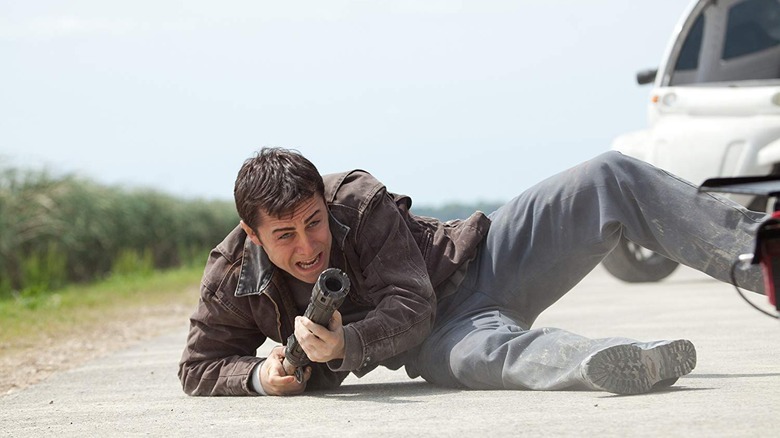 Joe (Joseph Gordon-Levitt) is part of this murder machine, working in 2044 for a Kansas City syndicate as a "looper." Loopers are hitmen tasked with killing people the mob sends back in time to be murdered, then dumping the bodies. The job is simple: Be at the scheduled place and time with your blunderbuss (a simple shotgun) and shoot the hooded figure that appears. You take the bars of silver strapped to the target's back, then dump the body and cash in your payment. At some point, the syndicate will send a looper's future self back in time, and they will serve as their own past self's target. You don't know that you've shot your future self until you see the gold bars strapped to the target's back. At this point, you have "closed your loop," and you cash in your gold and live out the rest of your days as happily as you can. It's all meant to be a clean and closed system, unless someone decides to break the rules. 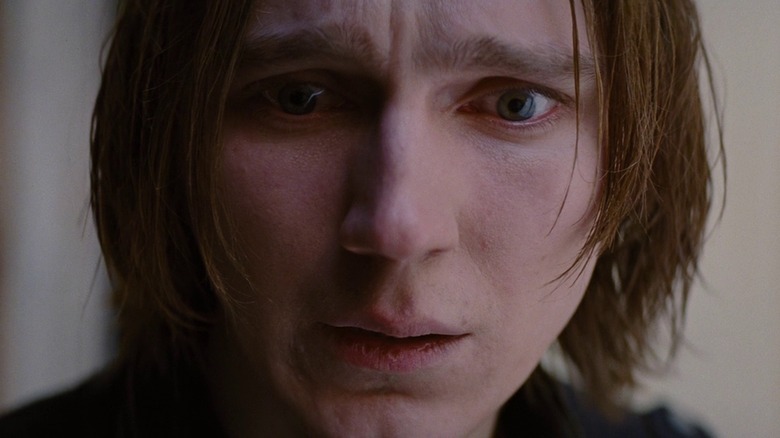 Joe's life of killing, partying, and saving up his silver for a retirement in France is thrown into chaos when his friend and fellow looper Seth (Paul Dano) shows up at his house one night in a panic. Seth was just tasked with closing his loop, but when his future self arrived he convinced Seth to let him go by telling him that the future is plagued by a new mob boss known as the Rainmaker, who's preparing to take total control of the syndicate by overthrowing every other boss and closing every loop. Naturally, Seth is terrified. 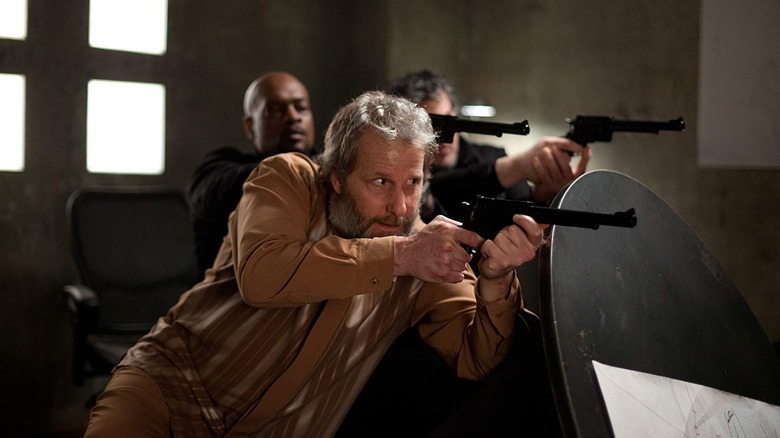 Joe hides Seth in his silver safe, but the syndicate's representative from the future, Abe (Jeff Daniels) brings Joe in and threatens him with the loss of half his saved silver if he doesn't give Seth up. Joe does, and the fleeing future Seth is killed when the syndicate begins carving pieces off of present Seth as punishment. Later, when Joe goes to kill his next target, the target spins and shields himself with the bars on his back. They're gold. It's Joe's older self (Bruce Willis), who knocks him out and flees. Joe was supposed to close his loop, but now his future self is on the run. Then the film shows us exactly why Joe is fleeing: In his future, he met a wonderful woman who saved him from drug addiction, only to watch her be murdered by the Rainmaker's men. Joe goes back to his apartment, only to find Abe's henchman Kid Blue (Noah Segan) is pursuing him, so he ultimately sets a meeting with Old Joe at the diner where he used to go after each hit (by carving the place into his own arm so it makes a scar for his future self to see). Old Joe explains that he stopped the closing of his own loop because the Rainmaker is wreaking havoc on the future, and that led to the death of his wife. He received a set of numbers from a friend in the future which reveal the date of birth and hospital code of the Rainmaker, and he plans to use it to kill him as a child, changing the future and saving his wife. Abe's henchmen arrive and both versions of Joe escape, but not before Joe steals a piece of Old Joe's map to the Rainmaker. 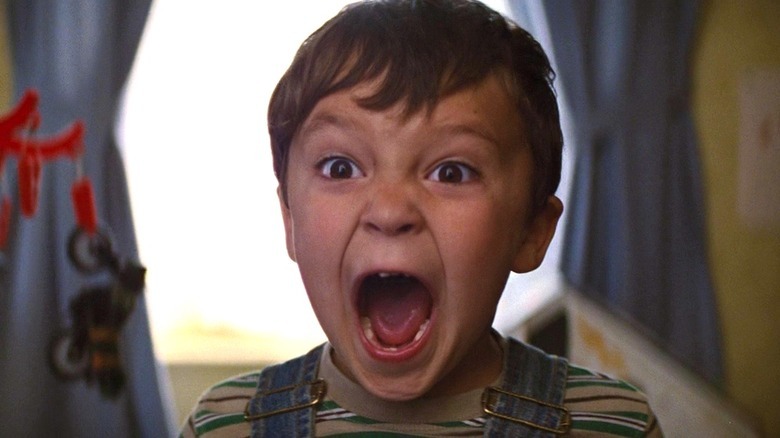 He follows it to a farm, where he meets Sara (Emily Blunt), who lives there with her son Cid (Pierce Gagnon). Joe realizes that Old Joe is killing all three children born on the same date in the same hospital, which means he'll eventually come for Cid. He decides to stay at the farm and protect Sara and Cid, but one of Abe's henchmen also eventually shows up to look for him. That's when Joe discovers a secret Sara's been keeping about Cid. When Abe's associate Jesse (Garret Dillahunt) discovers Cid hiding in Sara's house, he briefly aims his gun at him. Cid panics and falls down the stairs, triggering a telekinetic episode (Sara also has minor "TK" powers, but Cid's are deadly) in which he explodes both Jesse and much of the farmhouse. It's then that Joe realizes Cid is the future Rainmaker — and because it's now in his memory, Old Joe realizes it at the same time, but is waylaid when Kid Blue captures him. Old Joe manages to break loose and slaughters everyone at Abe's headquarters, then heads to the farm to kill Cid, setting up a showdown with his past self. Old Joe arrives at the farmhouse and fires a shot at Cid, who is struck on the cheek. Before he can explode his TK powers again, Sara calms him down and sends him running into the sugar cane fields while Old Joe continues firing at them. As Sara stands between Old Joe's gun and Cid, Joe realizes that Old Joe will kill Sara, and this trauma will turn Cid into the Rainmaker. Joe realizes he's part of a cycle of violence, a loop with greater consequences, and decides to end it. He turns his blunderbuss on himself and fires into his heart, erasing Old Joe and saving Sara, Cid, Old Joe's wife, and the future. The segment of the film right after Old Joe arrives in the past gives us a clear, if brief, picture of what happened to him: He moved to Shanghai instead of France (taking Abe's advice that he should go to China), spent all the money he saved on drugs and then took up life as a hitman again (not a looper) to fund his habit. All that changed when he met his wife (Summer Qing), who cleaned him up and showed him the only real happiness he'd ever known. With Joe's decision to turn his gun on himself, that's all over. The future Old Joe knew never happens in any form in the main timeline of the film, because Joe will never age into that version of himself and travel to Shanghai. Perhaps in some alternate timeline Old Joe and his wife are able to live happily ever after in the absence of the Rainmaker, but Joe made a choice to sacrifice himself and his potential future to save others. At the time of Looper's present, Joe is told by people who've been there that the future is a world in which Old Joe murdered Sara, sending Cid into the rage that would ultimately make him the Rainmaker and creating chaos within the realms of organized crime. With Old Joe's death, that is no longer the case, and while the film never shows us a glimpse of their future, we do now know that their present is one filled with possibility. In the film's climactic moments, we see that in a moment of crisis Sara is able to have a calming effect on Cid's TK abilities, and he is finally able to embrace her more and call her "Mom" (he previously called her Sara since she allowed someone else to raise him during her partying days). Their relationship is stronger than ever in the wake of Joe's death, and the car that Old Joe drove out to the farm is full of silver bars, making them financially secure. With that in mind, and their combined TK abilities, it's possible that Cid will grow up to be a person of great influence, but in a positive way, helping the world rather than breaking it with his gifts and his resources. Seth tells Joe that the Rainmaker's future ambitions include closing all loops and taking over all mob operations from other bosses, consolidating power in a way that would break the current system. Because Cid no longer becomes the Rainmaker, that won't happen, which means the old system of several bosses is likely still in place in the future that exists after Joe's death. The lack of a Rainmaker won't erase organized crime; in fact, it might even strengthen the old way of doing things, but the events set in motion by Old Joe will no doubt still have an impact. In the past, Old Joe still killed Abe and all of his associates, and Joe made the choice of killing himself rather than closing his loop. The bosses in the future will have knowledge of these events, and may adjust the loop closing system accordingly. Perhaps loopers will kill each other's future selves on the same day, closing two loops at once without any conflict of interest. Perhaps some other system for killing future loopers will be put in place. Perhaps the Kansas City faction will be reorganized or relocated altogether. Whatever the case, the organized crime use of time travel will likely never be the same. One of the ideas put forth by Looper's ending is how quickly one man can make a massive change to his world with a single, split-second decision. Joe pulls a trigger and kills himself, and yet the death of a single man has a ripple effect that could reshape not just Sara and Cid's future, but everyone's. In killing himself, he has just ensured that countless other men he might have killed as a future hitman will be spared. He has ensured that the woman he would come to love as Old Joe will no longer die at the hands of the syndicate. He has ensured that the Rainmaker will no longer rise and begin taking over all of organized crime, likely saving even more lives. Or has he? Yes, Joe changed the future when he killed himself, and anyone who directly died because of Old Joe's actions is now spared… at least from dying by Old Joe's hand. In its own way, Joe's death creates another timeline filled with a different kind of uncertainty. Yes, his wife lives now, but what other dangers await her? Yes, Sara lives now, but does that mean she'll be spared from ever suffering or dying again? Yes, Cid gets to be cared for by his mother, but does that mean he'll always be free from trauma that will push him to do evil? Joe is, after all, just one man. 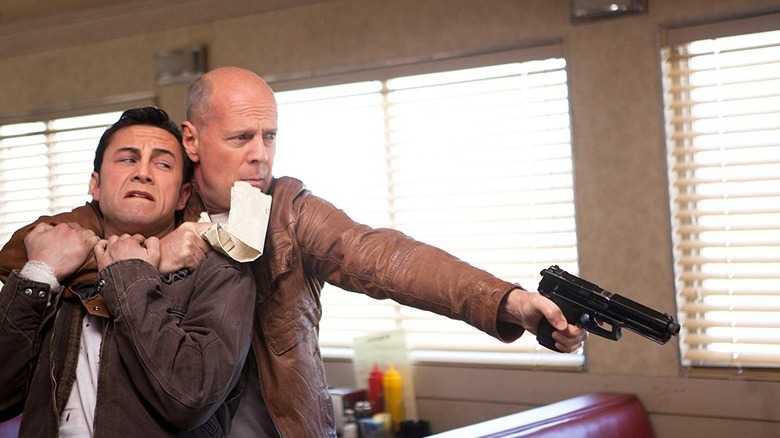 Looper is a science fiction film, and specifically a time travel film, but there are big ideas at play beyond time machines and alternate timelines and futuristic assassins trying to reconcile their pasts and futures. According to director Rian Johnson, the central concern of the story for him was "the power of a parent's love," and indeed it's Sara's love for Cid and how Joe perceives it which sets off the film's endgame, and the timeline-altering decision that Joe makes to save Cid. 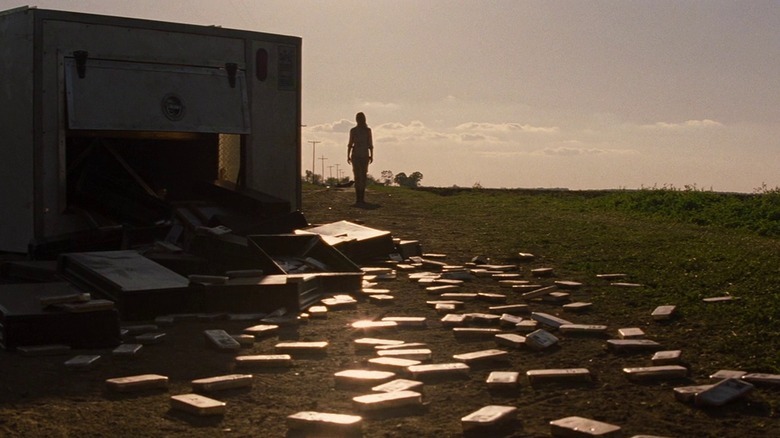 Thematically, Looper is a story about learning what's really worth saving, and we get to see that through the arc of both Joes. Joe begins as a guy who doesn't seem to care about much other than his own eventual freedom, and grows to understand that there are bigger concerns than his own life, including Cid's future, Sara's love for her son, and the greater future with or without the Rainmaker. Old Joe lived as an assassin and an addict, then came to understand that the love of his wife was more powerful than any of that, so much so that he was willing to fight beyond his own lifespan to save her. Joe's ultimate sacrifice is his realization that his own concerns are minimal compared to those around him, and the implications of what might happen if he doesn't take drastic action are worth the sacrifice. This thematic thread, helped along by Joe's final narration, is the perfect dramatic cap to the film's arc. Even with the limited scope of the story — there are only four main characters, and two of them are the same guy — Looper is a very complex movie simply because it deals with time travel in such an intense way. The film really gets its hands dirty with the concept, telling us a story of men from the past who change the future with the pull of a trigger, and even cut off their own timelines for money. That means there are a lot of loose ends to ponder in the film… if you choose to ponder them. Writer/director Rian Johnson acknowledges that there are a lot of plot possibilities at hand (does Cid still become the Rainmaker if something else happens to Sara? ), and that Old Joe's death raises a number of potentially paradoxical questions about how Old Joe could have known about the Rainmaker if young Joe doesn't kill him and grow up to be him, but his suggestion is to think more about the story than the implications. "That's the Terminator question. If it's important to you to really justify that beyond 'It makes sense in a story type way,' you'll have to get into multiple time lines existing in neverending loops of logic. You can shoehorn it into making sense," Johnson explained. "For me it's a trope of time travel movies and there's a slight amount of magic logic that you have to apply in order for a story like this to make sense." 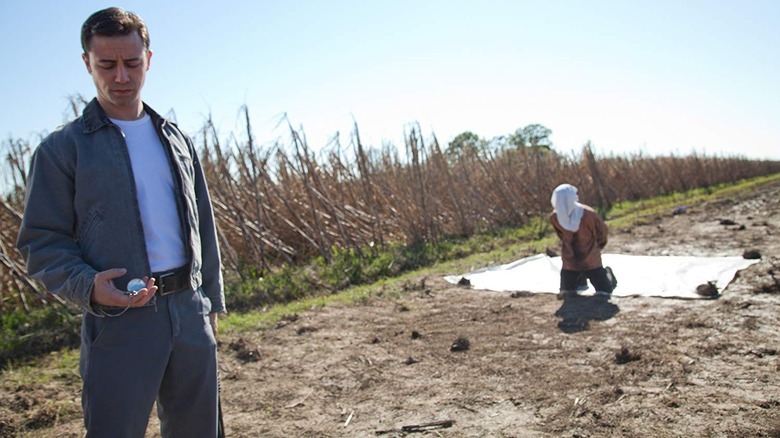 Looper was one of a number of films released in the late 2000s and early 2010s that helped change the face of modern science fiction filmmaking not because of its story, but because of its eventual business success. With a budget of $30 million, Johnson's film went on to gross nearly $180 million worldwide, and helped cement him as a director worthy of big projects alongside fellow rising stars like Alex Garland (Ex Machina), Duncan Jones (Moon) and Denis Villeneuve (Prisoners). Soon, Johnson joined the Star Wars franchise, and from that collaboration we eventually got The Last Jedi, along with a still-developing all-new trilogy of films set within that saga's overall galaxy. Filmmakers who found similar success with mid-budget films in the same era have also moved on to bigger things. Villeneuve, for example, went on to make Blade Runner 2049 and an adaptation of Dune, while Jones directed Warcraft and Garland directed Annihilation. Looper was not a game-changer in the sense that it reshaped filmmaking, but it did — like the characters within it — create a ripple effect in the sci-fi filmmaking community that allowed Johnson to move on and make dramatic additions to one of the genre's biggest franchises.